The U.S. National Junior Team came into their second game as heavy favorites over Slovakia. At times they certainly looked like it, but a lack of consistency and discipline throughout the contest made the game tougher than it needed to be for the U.S. Still, they managed a 6-3 win to improve to 2-0-0-0 (W-OTW-OTL-L) at the World Junior Championship. Team USA got a lot more resistance from a faster, more skilled Slovakian team than they experienced against the Czechs, but were able to skate away with the right result thanks to some timely scoring and early proficiency on the power play. It wasn’t a full 60 minutes out of the U.S., which is something they’ll want to clean up, but it’s also part of progressing in the tournament. The U.S. did do a better job of finishing the chances they got and Jon Gillies made some huge timely saves, and the U.S. was able to walk out with a win despite not being at their best. That’s an important building block. Now they have things to work on when they meet Germany Sunday. Finding some level of consistency will be a big key to the next few days in games and practice, but this U.S. squad has shown they have the talent to make up for some of their mistakes. They’ll be happy to get the win and move on knowing where they need to improve before the big New Year’s Eve tilt with rival Canada. After the jump, a scoring summary, general team notes and many thoughts on individual players for Team USA. 1. Jack Eichel (Hartman, Butcher), 16:53 (pp) — With the defense apparently losing Eichel in the middle of the ice, Ryan Hartman dished an easy pass to the wide-open Eichel, who slid it five-hole on Richard Sabol. 2. Danny O’Regan (Grzelcyk, Kerdiles), 19:59 (pp) — Just before time expired, Nic Kerdiles tipped Matt Grzelcyk’s shot-pass to the front of the net. O’Regan shoveled it in to the wide open cage. 3. Ryan Hartman (Butcher, Eichel), 4:22 (pp) — With a nicely-placed pass from Will Butcher, Hartman rifle a one-time slap shot into the upper-left corner of the net just under the bar to give the U.S. a 3-0 lead. 4. Matt Grzelcyk (Carrick, Di Pauli), 9:33 — The U.S. finally scored an even-strength goal when Connor Carrick’s wide shot bounced off the back boards and right to Grzelcyk who snuck down from the point and put the puck into the open net to make it 4-2. 5. Stefan Matteau (Copp, Fasching), 14:15 — Another solid shift by Team USA’s energy line led to a turnover forced by Hudson Fasching’s body check. The puck bounced right to Andrew Copp who fed it to a wide-open Matteau, who calmly roofed the puck into the top-right corner to make it 5-2. 6. Riley Barber (Kerdiles, Copp), 16:34 — Riley Barber finished a terrific passing play as Nic Kerdiles feathered a puck to Andrew Copp in stride. With Barber and Copp two on one, the latter slipped the puck to the former for an easy goal to take a 6-2 lead. Here are the highlights from today’s game via the IIHF. – Six players had two points for Team USA including Jack Eichel (1-1), Matt Grzelcyk (1-1), Ryan Hartman (1-1), Nic Kerdiles (0-2), Will Butcher (0-2) and Andrew Copp (0-2). – The U.S. went 3-for-5 on the power play, scoring on their first three opportunities of the game. – The U.S. committed six minor penalties and allowed two power-play goals. – Andrew Copp won 16 of 24 draws, while Danny O’Regan won 11 of 16. – Nic Kerdiles led Team USA with eight shots on goal. Linemates Riley Barber (7) and Danny O’Regan (6) were second and third. Defenseman Matt Grzelcyk had five shots on goal. – Team USA out-shot Slovakia 47-30, including a 22-11 shot advantage in the first period. – The lull Team USA endured through the second period is what will stick out in my mind from this game. It’s a real point of concern as the U.S. had complete control just minutes prior to Slovakia scoring its first goal. Penalties, turnovers and perhaps a lack of properly-channeled intensity really impacted Team USA negatively at parts of the game. That won’t work against a team like Canada or any or any of the other top teams in the tournament. That could be a difference in tougher games. – The first three power plays were fantastic for Team USA. They were finding lanes and opening up the ice for each other out there and Slovakia didn’t have an answer. The U.S. was moving the puck extremely well in all areas and really took advantage in transition. The defense was actively involved in setting everything up from the blue line and the forwards were getting to the net well. – Early in the game, even when the U.S. was playing well, the 5v5 play was only OK. They weren’t finishing off plays like they have the skill to do. Team USA also wasn’t generating enough quality chances in tight despite the number of shots they were getting. If you can’t find ways to get shots from the middle of the ice, you’re going to struggle to score and that was the case a lot early, despite getting 22 shots on net in the first. – The U.S. had about a three- or four-minute stretch of the second period where they were at their absolute best in the game. The team was playing fast, overpowering hockey that culminated with Hartman’s blast for a power-play goal. Then they took their foot off the pedal and their game fell off. The U.S. isn’t going to play a full 60 at the speed they did for that brief stretch in the second, but the more they play like that, the tougher they’re going to be. – The good news for Team USA is that they didn’t play their best game start-to-finish and still won 6-3. They had a lot of solid plays that led to goals. I think they finished their best chances better today than they did against the Czechs, which should be encouraging. – Zach Stepan did not dress today due to a lower-body injury and he is listed as day-to-day. He left the Czech Republic game early and did not practice yesterday. Tommy Di Pauli saw more ice time as a result and made the most of it, showing some good speed on shifts. Matt Grzelcyk — Grzelcyk was named Team USA’s player of the game and was a deserving recipient. His speed in all zones and quality puck-moving skills were on display against Slovakia. He also showed good instincts with or without the puck and made a lot of great plays due to solid positioning and awareness. He had a goal and an assist and was a factor throughout the game. When he is at his best, Grzelcyk is an offensive weapon without being a defensive liability. That was definitely true today. Jon Gillies — I didn’t like the goals Gillies gave up today, but he had several key saves in this game that made a huge difference. He stopped two 2-on-1 chances in the first, a shorthanded breakaway in the second and made an easy stop on a 4-on-2 break that were key saves at the time he made them. I thought he was more of a blocker today in net with a lot of rebounds out there, and that was uncharacteristic. I think he’ll be better than he was today, but in all honesty, those stops I mentioned may have been game-savers. When you’re No. 1 guy gives you saves like that, he deserves a lot of credit. 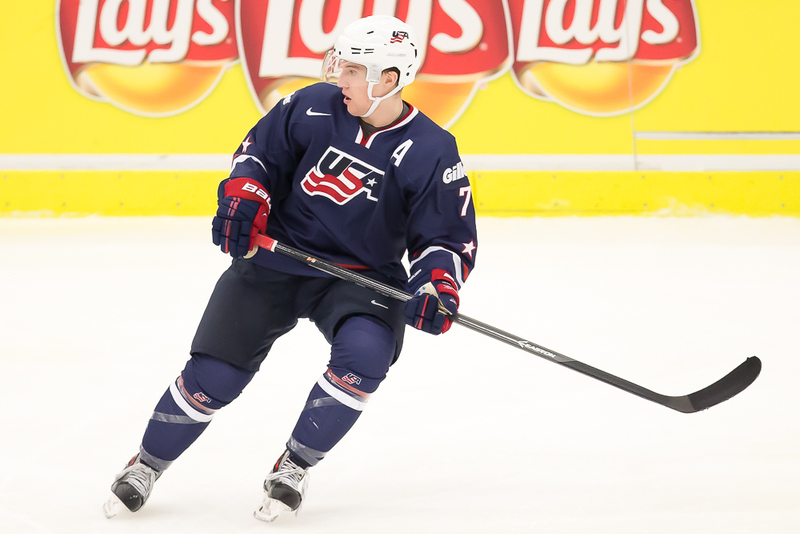 Jack Eichel — Once again, Jack Eichel was consistently Team USA’s most dynamic forward. He had a goal and an assist and his puck play throughout was really something to behold. He’s only 17, but the patience and poise he possesses are really noticeable. Not only that, but his physical strength to fight through checks and get the puck on his stick are all terrific skills. When he turns it on, Eichel can be dominant up front. Ryan Hartman — I thought Hartman was much better today compared to the first game and he was rewarded with a goal and an assist. His one-timer in the second period to make it 3-0 was a thing of beauty. Hartman also delivered one of the game’s hardest hits in the third period along the boards. He’s able to generate offense and be an absolute bear to play against and I saw that more today than in the Czech game. He and Eichel were consistent threats in this game and they finished the two best chances they had. Riley Barber — Team USA’s captain once again shows why he wears the C. When the game gets tough, Barber rises to the top. He was excellent in the first and third periods and maybe fell into the trap the rest of the team did midway through the second, but he had some great opportunities that he generated with his speed and strength and was able to finish the game off with the sixth goal of the game. He and Nic Kerdiles do a lot of dirty work on their line, but also have the touch to produce. Barber has the ability to take over shifts when he wants to. Nic Kerdiles — I really liked Kerdiles throughout today. He was generating shots and good chances, getting to the hard areas and taking contact for the sake of making a play. His physical strength is an asset and I like the way he’s able to get shots in tight. Steven Santini — Once again, I thought Santini was Team USA’s best defender overall. His skating ability and physical play were out there for all to see in this game again. For a younger guy, he’s very smart and closes gaps so well. There were a few instances where he was a little overzealous in trying to go for the big hit, which he’ll have to be careful about, but he was very effective again. Will Butcher — The power play is better when Butcher is setting things up and he did that well today with a couple of assists. He has poise with the puck on the blue line during the power play and finds the seams for passes or shots. I liked his distribution today a lot. Stefan Matteau — Team USA’s third line wasn’t as good today as it was against the Czechs, but it was still a huge factor. Matteau played physically and his strength on the puck was notable. He did score a goal on a nice finish from the slot. He also took another minor penalty, which he’ll have to be careful about. It was a careless interference call that he just didn’t need to commit. That said, I like the way he plays and he needs to bring that same game against Canada. Andrew Copp — Copp is another guy who uses speed and physical strength to make things happen, but he showed nice touch in collecting a pair of assists. His speed is definitely a factor every shift. He plays hard every time he’s on the ice and gives the U.S. a really difficult guy for opposing teams to deal with. Danny O’Regan — I really like the way O’Regan compliments Kerdiles and Barber. He just makes himself available when they go to do the work and he even got a goal today by being at the net-front. His playmaking ability is certainly working well for his line, but he kind of takes a backseat to his wings, which is exactly the way he should be playing. I liked what he brought much of the game today. Connor Carrick — Carrick hasn’t always been the most noticeable guy, but he does a lot of good things with the puck when he has it. His shot off the back boards for Grzelcyk’s goal was a smart play you’d expect a pro guy to make. He looked like he was asserting himself more against Slovakia and it paid off well. Ian McCoshen — McCoshen had a few miscues today, but was overall solid, I thought. The way he plays allows Grzelcyk to freelance a bit more and take a few chances. McCoshen is so calm and steady and takes the game as it comes to him. He’s engaged in all zones, plays physically when he needs to and just keeps everything very simple. Hudson Fasching — Fasching had some really nice moments near the net and down low. I’ve really liked his play behind the opposing team’s net and in the corners. He’s so big and strong that he just imposes himself on the other team in a very aggressive manner. Fasching doesn’t play mean, but he plays kind of tough, if that makes any sense. He’s hard on the puck and isn’t afraid to deliver a check. It helps make Team USA’s third line so overpowering at times. The U.S. will meet Germany Sunday morning at 9 a.m. ET on NHL Network, with the game streaming live and free on NHL.com. You can expect a full preview of that game on United States of Hockey later today. I just read andrew podnieks’ recap. Gawdawful! He writes that McCoshen kneed Kolena. I watched the game twice. I saw that he tripped the guy with a stick. Did you see McCoshen knee him, or anyone else on this game? I don’t think I missed that, but I could be wrong. Thank you for giving honest reports and fair criticism.